To make a custom hand made knife is a skillful art that requires hard work and careful attention. 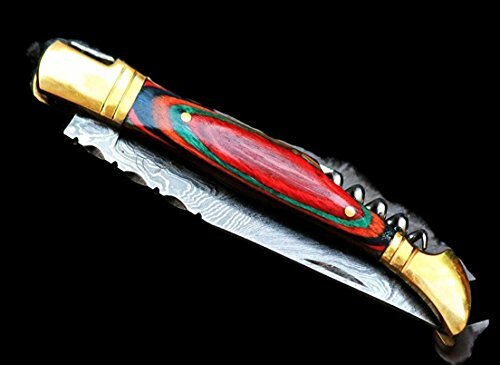 This marvelous knife is very impressive due to its excellent design & detail. We take great pride when designing our knives. The knife is well balanced and has an excellent grip, creating a natural weight and feel when held. Our craftsman put extra work in each knife by carefully designing, carving and hand making it into a breathtaking work of art. There may be slight variations in finish, colors, etc. because they are hand made and variations in natural materials. You are purchasing a knife that will give you many years of great service as well as provide a family heirloom that you can hand down to family members. Please see our full line of knives...we have a fast growing base of knife collectors that eagerly wait for new knife releases. Buy two or three different model DKC Knives and you will see. Our knives are value priced and compare to other custom knives costing two to five times the amount we sell our knives for. Since knives are one of those areas where its possible for fake copies to be made, please be sure to purchase only from SAN FRANCISCO SUPPLY the only authorized factory reseller of DKC Knives. In addition, starting January 1, 2015 most of our knives will have a DKC engraving. Look for factory information in your box about knife care. Knives are well boxed, and typically arrive wrapped in plastic with a good coat of oil to protect the knife. When you receive your knife, take a soft cloth and clean off the knife..but as with all steel knives..keep it well oiled to preserve function, look, and beauty. Knives are for responsible adults only. You must be 18 Years or older to purchase this knife. While all our knives are field quality, we do not support or advocate the use of knives for any type of violent activity. We look forward to having you as a long term customer and thanks for purchasing a fine quality knife. THANKS FROM DKC KNIVES ! Full Grain Hardwood Compare to Knives 2 to 4 times the cost. HAND CRAFTED BY ARTISANS ! See our full line of DKC Knives .